VIENNA, Austria -- Seven years ago, Ukraine’s Orange Revolution inspired hope that the country was moving towards genuine democracy. 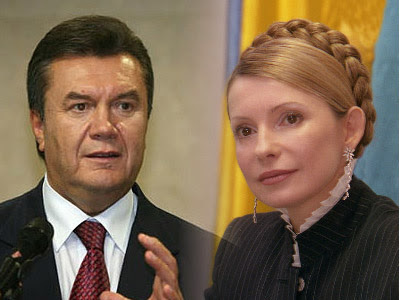 Viktor Yanukovych and Yulia Tymoshenko. Since then, democratic freedoms have been curtailed, the former prime minister and co-leader of the revolution, Yulia Tymoshenko, has been imprisoned, and President Viktor Yanukovych’s regime has become internationally isolated. Today, a small group of oligarchs clustered around Yanukovich have captured power. They manipulate elections, control the media, and are shaping the country’s institutions to further their own business interests. Condemnation by the West has had no impact. So long as they control the country’s industries and natural resources, they will maintain their grip on power – the approach perfected by their role model, former Italian Prime Minister Silvio Berlusconi. Whatever one thinks of Tymoshenko, she was not imprisoned for any ostensible crimes she committed while in power. She is in prison because she lost that power. This sets a dangerous precedent, for it creates a powerful incentive – winner takes all, loser goes to prison – for ruthlessness. It is difficult to predict how Tymoshenko’s case will play out – whether Yanukovych will succumb to pressure from the European Union and the United States to release her, or to the forces that want to exclude her from politics forever. Until recently, Ukrainian leaders were accustomed to more efficient means than prison for dealing with inconvenient opponents. In 2000, for example, the journalist Georgiy Gongadze was kidnapped and beheaded after publishing online reports about high-level government corruption. During the ensuing investigation, former Interior Minister Yuriy Kravchenko died of two gunshots to the head hours before he was to testify. Perhaps Tymoshenko herself did not understand how sharply her country had turned away from democratic norms when she mocked Yanukovych and her opponents during her trial. Indeed, her first brief imprisonment in 2001 furnished her with political capital and pushed her into the democratic opposition’s front ranks. Perhaps Yanukovych himself did not foresee the consequences of Tymoshenko’s arrest, trial, and imprisonment. Some Ukrainian conspiracy theorists – of whom there is no shortage – maintain that Yanukovich was tricked by skillfully prepared misinformation provided by the officials around him. If the EU refuses to sign an Association Agreement with Ukraine at the upcoming Ukraine-EU summit in Kiev on December 19 because of Tymoshenko’s imprisonment, the damage to the country will be vast and enduring. But, with every month that Tymoshenko spends in jail – more than three so far – her martyrdom grows, making it harder for Yanukovych to free her. Yanukovych has become hostage to a situation that he created – and thus has done nothing to extricate himself from it. Russia’s then-president, Vladimir Putin, put himself in an analogous bind in 2003 with the arrest of the oil oligarch Mikhail Khodorkovsky. At the time, Khodorkovsky was the wealthiest man in Russia and an open critic of the Russian government, so his arrest triggered a storm of international protest. Like Yanukovych, Putin is under pressure from the West to release his opponent, but the political risk is too great. He does not respond to European pressure, even though Ukraine would gain political leverage from closer EU ties. Perhaps he simply dislikes the EU because it applauded his defeat in the Orange Revolution, and because he makes embarrassing gaffes whenever he goes there. Then again, perhaps he has learned from Belarusian President Alexander Lukashenko that the EU has little influence over non-EU countries’ internal politics. At the first positive sign from Belarus, the EU forgives and forgets. Indeed, even without a positive signal from Ukraine, the European Parliament has recommended that negotiations on the Association Agreement begin. Generally, Yanukovych’s foreign policy appears reactive. In 2010, for example, he bowed to Putin’s pressure to extend the Russian lease on naval facilities in Crimea to 2042, whereas Tymoshenko and others pointed to the treaty’s unconstitutionality. Yanukovych also undermined Ukraine’s geopolitical strength vis-à-vis Russia by rejecting NATO’s invitation to join in 2010. Even if the Kremlin is not particularly happy with the planned EU-Ukraine Association Agreement, it has little reason to worry as long as Yanukovych remains a weak president in a divided country. Ukraine is thus becoming a dangerous mix of authoritarianism and corrupt capitalism. In Belarus, an impoverished Lukashenko increasingly resorts to brute force to maintain his rule – breaking up peaceful demonstrations, imprisoning political opponents, and terrorizing the intelligentsia. Compared to him, Berlusconi is a shining example of good government. But, as Yanukovych and his backers are well aware, Berlusconi is gone, and Lukashenko is not.